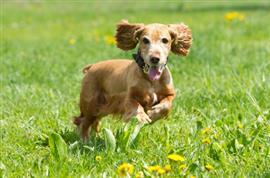 The hyper dog names list consists of names intended for the highly-energetic dog. Each of the ideas is derived from something quick or full of energy. Quick based ideas can be taken from a variety of themes. A few weather related names are Lightning, Hurricane, and Bolt. Characters from popular cartoons and video games that are known for their swiftness include Speedy, Taz, and Sonic. Chopper, Jet, and Ferrari are some speed-related vehicle options. Other fast ideas come from weaponry like Bullet, Atomic, Flash, or Rocket. The most popular theme is definitely the puppy itself. We have included many active behavior related names like Havoc, Frenzy, Pounce, and Chaos. Various ideas taken from energy itself include Kinesis, Volt, Watt, and Fission. How well a name from this list fits is directly related to the dog's energy level. A dog that is commonly found zipping around the house is likely to find a perfect fit, while the dog that lays on the porch all day will only find irony. Some of our pages will contain a subcategory. A subcategory is a slightly more specific grouping than the main topic of the page. For a subcategory, we will include a separated table of names and corresponding descriptions. An example of a subcategory of Red Dog Names would be 'Dog Names Inspired by Red Wines'. If you have any subcategory ideas for the Hyper Dog Names page, we would love to hear them. Use the form below to submit your ideas.